World number two Caroline Wozniacki was beaten by Russia's Daria Kasatkina in the fourth round at Indian Wells. The Dane, who could have reclaimed the top ranking by winning the tournament, was beaten 6-4 7-5 by the Russian. Romania's Simona Halep, who moved into the quarter-finals with a 7-5 6-1 victory over China's Wang Qiang, will retain the number one ranking. Kastatkina, ranked 19th, lost 10 of the first 11 points of the match but hit 20 forehand winners on her way to victory. She overpowered Wozniacki, breaking her serve six times and winning 54% of her first serves. 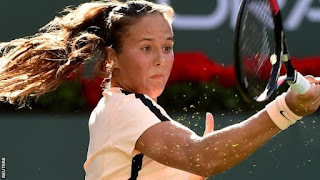 Kasatkina had previously beaten Wozniacki in straight sets at the St Petersburg Open in February. She will face Germany's Angelique Kerber in the quarter-finals, following Kerber's 6-1 6-1 win over France's Caroline Garcia. Kerber, ranked 10th in the world, has won 16 of her 19 WTA matches this season. Former world number one Karolina Pliskova also made it through to the quarter-finals, beating 16-year-old Amanda Anisimova 6-1 7-6 (6-2). American Anisimova, a tournament wildcard, had beaten ninth seed Petra Kvitova in the third round. Czech Pliskova, the world number five, will play Japan's Naomi Osaka, who beat Maria Sakkari of Greece 6-1 5-7 6-1. Venus Williams also progressed to the next round with a 7-6 (8-6) 6-4 win over Latvia's Anastasija Sevastova. In the men's event, world number three Marin Cilic suffered a defeat in straight sets by Philipp Kohlschreiber, losing 6-4 6-4 to the German. Kohlschreiber will next play the unseeded Pierre-Hugues Herbert, who won his third-round match when fellow Frenchman Gael Monfils retired with a back injury. Juan Martin del Potro beat Spaniard David Ferrer 6-4 7-6 (6-3) and will play fellow Argentine Leonardo Mayer, who defeated Japan's Taro Daniel 6-4 6-1.